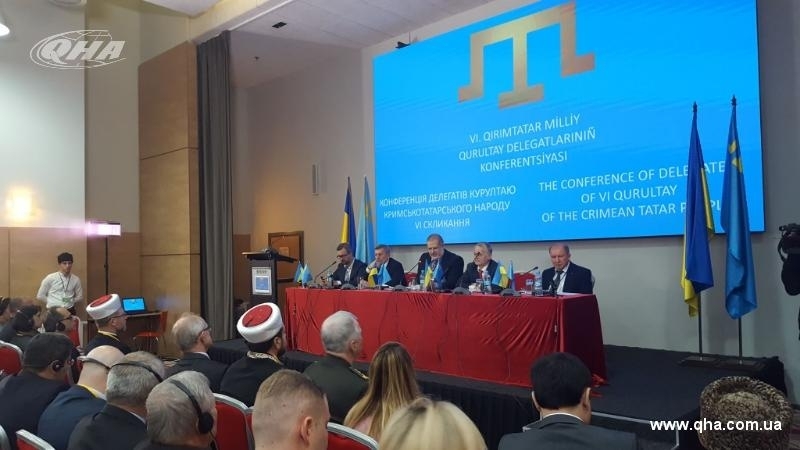 A significant part of the delegates of the Qurultay of the Crimean Tatar people insists on excluding those members from the Mejlis of the Crimean Tatar people who, after the annexation of the Crimea, agreed to cooperate with the occupiers. The leader of the Crimean Tatar people, Presidential Commissioner of Ukraine for the Affairs of the Crimean Tatar People Mustafa Dzhemilev made a corresponding statement today, November 12, at the conference of delegates of the Qurultay in Kyiv. According to him, new members of the Mejlis are offered to be elected instead of the collaborators. Dzhemilev further noted that this decision requires a quorum. Many delegates of Qurultay could not come from the Crimea to the conference in Kyiv, but they have to express their attitude to the decisions made on Qurultay. “The percentage of people who agreed to cooperate is small. And, according to many delegates of the Qurultai, they can be ignored. We will solve this issue after discussions." Mustafa Dzhemilev went on saying that the regulations of the Qurultay of the Crimean Tatar people stipulate that its delegates only complete their powers after electing a new composition of the Qurultay, at its first session. “Since we do not have the opportunity to hold democratic elections and convene a new Qurultay, we can consider the powers of the delegates of the current Qurultay to be automatically prolonged." Dzhemilev also noted that under occupation, the Crimean Tatar people have no prospects on the peninsula. QHA reported, that Mustafa Dzhemilev urged residents of Crimea to collect data indicating the mass resettlement of Russians to Crimea, to record the facts of human rights violations and the names of people who commit this lawlessness, and transfer to the office of the Mejlis of the Crimean Tatar people in Kyiv. Earlier, Mustafa Dzhemilev noted that because of the opposition of the occupation authorities, it would not be possible to collect a quorum at the Qurultay conference. In this regard, a voting mechanism was developed for those who cannot leave the Crimea. The draft decisions, which will gain the most votes in Kyiv, will be transferred to the delegates for voting in the Crimea. Decisions will take effect after collecting all votes.